We woke and got around slowly this morning –Ebony and Rachel had arrived around 2am and we stayed up chatting about our experiences so far in Colombia, so we were really tired! It was so nice to catch up and compare and contrast our situations teaching English is different areas of the country. Ebony is a lot like me – she likes cooking and we enjoy the same type of food – She had been interested in going to Paloquemao since orientation, so I was eager to take her there to explore the greatness of the market! Ekatarina was due to arrive about 1pm or so on a flight from her city of Santa Marta (She is the lucky one who gets to live by the ocean!! ), and Gaby had still not left Funza, soooo.. we decided to go ahead and go out and get some things done. We walked to the market and on the way we found a cute little garden with sculptures formatted on old stones from pre-historic times. It was tucked in the middle of a busy intersection. Of course we stopped to explore! It is called “Parque de los Talladores en Piedra de Los Martires”. It was so cool – I love that about this city, there are things to see and explore everywhere you look! We had a great time at Paloquemao and bought and sampled tons of fruit. They have so many fruits here that we don’t have in the US. I got some coconut milk and some frozen fruit pulp to make smoothies for breakfast tomorrow! Sometimes I feel so lucky to be living here! We went back to the flat to meet with Ekatarina and get her settled in – Gaby still had not left Funza to come to meet us, so we decided to check another thing off the list and head out to Candelaria and the Museo del Oro. El Museo del Oro is the top tourist attraction in Colombia. 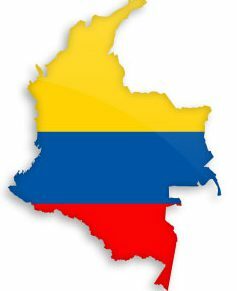 It is truly amazing and shares a lot of the Colombian history. It is not a big museum, but is impressive. There is a room that has a cool experience of how important gold was as a sacrifice in ancient times here in Colombia. When you enter the room it is all dark, then gradually lights shine on gold items around the room and get faster and faster until finally settling on a well in the floor in the middle of the room filled with gold items. Then the sounds of a rainstorm erupt around the room. It is super cool and very well done. We walked around the area and had fish for lunch at a place called Afrodisiaco – it was run by some people from the Choco area of Colombia. It was delicious! There are little places around Candelaria like this and it makes exploring so much fun. We went back to the flat and met us with Gaby finally. We walked to one of my favorite restaurants in Bogota called, “La Arepera” and then we went back to the flat to get ready to go out to Disco Jaguar – a really fun dance club that has both a salsa room and a reggaeton room. It is a reasonably priced club and a lot of fun. It is on Septima in Chapinero and is only 15,000 COP to get in. I have been there before and enjoy it for a night out and it is within walking distance of my flat! We made it home about 3 am – tired and happy. My new home – Chapinero! It turns out that I can move into the flat early. The guy who is renting it out has a sister that can show me into the flat a day early! I am very excited. I want to be moved in and sorted when I start work. I also really need to do laundry and am so anxious so cook! So today is move in day! Today is Friday – I had the hotel call a taxi to take me to the flat. I have my two huge suitcases and very full backpack to lug with me. I was really glad when I saw that it was the airport cab they called and not one of the tiny, yellow city cabs! I got into the cab and we barely moved! It was crazy! It is normally between 35 minutes and 1 hour to go the distance down Carrera Septima from Usaquen to Chapinero. I had expected it to take an hour at the most – it took us 45 minutes to go 3 ½ miles! I had to contact the sister to let her know that we were on the way, but that we were running late. I had estimated being there 10 minutes early, but we ended up being ½ hour late. I am so glad she waited as I was all checked out of the hotel and had nowhere to call home with my massive luggage. I fell in love with my new neighborhood instantly! It is young and vibrant and completely alive. My flat is equi -distant between the two main streets to get the transmilineo to each of my job locations. There is a small grocery store 2 blocks away and another large grocery store just 4 blocks the other way. There are numerous street food vendors on the sidewalks around my building and a bar on the corner with a roof-top terrace! The flat is super small and very run down, though it has everything I need – most especially a washing machine. The first thing I did was start the laundry, then I unpacked and ran to the store to get some basic groceries. I made some stew and hung up the laundry. I now felt at home. It is so nice to be unpacked and have my things around me and easily accessible. I feel better. I feel that I actually AM living in Colombia now. I am home. Weirdly, they did not want me to start today – I am going to be checking out my position at Canton Norte on Monday at 9am. I am going to be checking out my position at the CRI on Tuesday morning at 10am, but no set start date yet. It is all weirdly uncertain. I had expected more from the military, even the Latin cultured military. I arranged to meet with the fellow that has been at CRI for two years now this afternoon to talk about the language program and how I can be of help while working there two days a week with no real agenda. They have told me that I’ll be off for Semana Santa. So, basically, I’ll only work a few days and then I’ll be off for a week. Tranquila, Bonnie!! I went up on the transmilinio to 80th street station to meet with Mark. He was very interesting and full of information. It sounds like he’s going to be hoping to structure things well so that we are all more effective. I am looking forward to us four all working like a team and making this program rock!! I am also excited because I just found out that I could have my cat here in the apartment! I so hope he can come and stay with me!! I miss him so much. The gentleman who owns the flat told me that I can’t have pets because he is allergic to them. When I explained that my cat is a Russian Blue, and that this breed sheds very little and has fewer allergens in their saliva, and that I also am allergic to cats, but not to him, he relented and said that I can have him to stay! Yay! Sasha gets to come live with me. We had classes again all day today. Today’s teacher was much more interesting than yesterday’s teacher, so it was a little easier to stay awake today. It was cloudy and rainy all day today – really rainy with thunder and lightening! It was nice and comforting, but made for a sleepy day. I got to meet with my regional coordinator today – it was nice to get an idea of where I’ll be working finally! I learned more about what I would be doing and what area of town is best to rent in. That was really nice, I went on airbnb and booked an apartment for the month of April. The orientation is done on March 28th, but the apartment is not ready until the 1st of April, so I will need to stay in a hotel until it is ready. A bit inconvenient, but, I have an apartment booked!! I was so excited as well because it was under $500 per month and that is so very hard to find in Bogota. 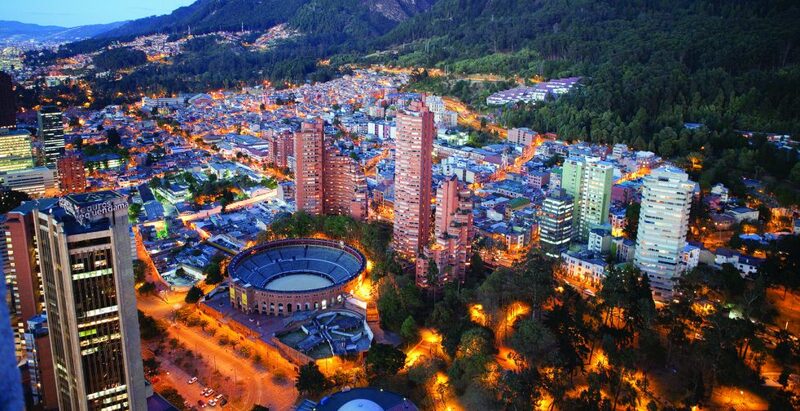 Bogota is crazy expensive for Colombia. Most people who live here live in houses with other people. Because my husband will be visiting sometimes, I need an apartment alone- he will have to work during the day from home and will need it to be quiet. I am going to try to book the apartment for May as well. I’ll have to move to a 2 -bedroom apartment for the months of June and July as the kids will be here, then I’ll move back to a one bedroom apartment. Moving will be at a minimum if I can help it at all. The apartment is in the Chapinero area of town. It is a young, vibrant neighborhood with a lot of universities and university students. It is in between Carrera 7ta and 13, so very convenient for buses as well. I think I will love it! If nothing else, I’m not homeless. It is a little hard to celebrate- as I am the first of my roomies to get a place to live. I really feel for them, because it is so hard to do and there is not much time to do it in. Many don’t have their school placements in their cities yet, so don’t know what area to even look in – the program really lacks in that department. A bit more help and notice in the department of housing would do wonders to help us fellows.